Music students at The Sixth Form College, Solihull are gearing up for two Autumn term concerts. The first concert of the year is a competition, when students audition for a bursary. This takes place at the Heartfield Wharam Scholarship Concert on Wednesday 24 October at 7.00pm in the College Theatre H201. A £150 bursary is available to the winner to spend on music tuition from an eminent performer of their choice. This bursary was set up in memory of two great musicians who strongly supported music in Solihull and at the College. Roy Heartfield was the original Head of Music at the College, who died in post in 1992, while Margaret Wharam was the former Head of Music at Malvern Hall and Head Organist at Solihull Methodist Church. The first winner of this prize was in 1994 and for the last 23 years the scholarship fund has continued. 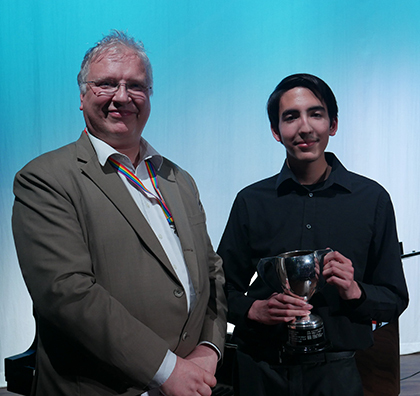 Last year, Jacob Fulford (pictured right with Principal Martin Sullivan) won the prize, following his performance of ‘Capricho Árabe’ by Francisco Tárrega on the guitar. Also highly commended was Jessica Jaques, who gave an impressive vocal performance of ‘Dear Mr Gable’ by James V Monaco and Joe McCarthy. Later in the year, students will perform at the annual Christmas Concert on Wednesday 12 December (7.00pm in H201), with a range of solo and group performances, songs from the Choir and audience Christmas carols. Admission to both concerts is free of charge, although there will be a retiring collection to raise money for the Music department. Tickets for the Heartfield Wharam Concert will be available on the door on the night from 6.30pm. Tickets for the Christmas Concert are available by contacting the Marketing department.